The Rev. Bill Wong is the interim pastor at PEACE Lutheran Church. I began my ministry as the intentional interim pastor at PEACE Lutheran Church, Grass Valley, on Oct. 1. At PEACE, we now begin a journey of transition. Our journey together through this transition will include change, conversation, discernment, discovery, listening, prayer, worship and, at the core of everything, God. We are on an adventure together with God, and God will lead the way. So here’s something for all of us to think about: During this past month, where have you noticed God? What do you see God doing? I am interested in hearing your responses. Here’s some additional information about me: I am a native of Los Angeles and married to Linnea West, who is an artist. Her glass studio is Design with Fire, in West Sacramento, where she produces glass pieces, teaches and offers studio time. We have two daughters. My home congregation is St. Paul’s Lutheran Church, Monterey Park, Calif. I cheer for Los Angeles sports teams, specifically the Dodgers and Lakers. In addition to leading congregations through their transition period between settled pastors, I have served on the staff at the Evangelical Lutheran Church in America’s national office in Chicago, and as an assistant to the bishop in our local Sierra Pacific Synod and the Southern Ohio Synod. 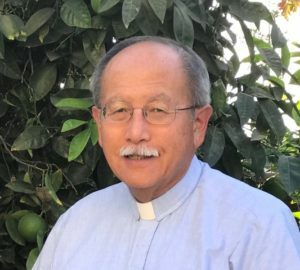 In addition, I have served as a settled parish pastor in San Jose, Davis and Tucson, Ariz.
As an interim pastor, I go where the Spirit blows. And the Holy Spirit has now blown me to Grass Valley. Part of my work at PEACE is to develop an understanding of this congregation and its surrounding neighborhood. This includes the mission field surrounding and served by this congregation. There is much to learn in a short time. Another aspect of being an interim pastor is the ministry of listening. I maintain an open door to the pastor’s office. So, I invite you to come so that we can become better acquainted and converse about God, the Bible, church, the world and whatever is on our hearts. Also, come and share your dreams, hopes, and vision for this congregation. This is also an opportunity for you to listen with me. During our conversation together, we can listen for God because Jesus is in, among, and around us. Where two or three are gathered in Jesus’ name, Jesus is present (it says so in Matthew 18:20). As the intentional interim pastor, part of my job is to help Peace members both embrace their history and move freely into their future. This involves seeing where God is calling Peace to be; cultivating and supporting new lay leaders; understanding Peace’s heritage with the ELCA and local community organizations; and committing themselves to moving into a new, shared vision. If you are interested in learning more about the transition at PEACE, you are welcome to ask me. If you decide to drop by, I suggest that you phone ahead of time to be sure that I am in the office. You also are welcome to make an appointment – call the church at (530) 273-9631. Also, if you desire a pastoral visit, or want to suggest I visit someone, I encourage you to ask and inform me. God has brought me and Peace Lutheran Church together for this interim ministry. I pray God’s guidance, support and wisdom be with us in our discernment, our ministry and our journey together during this transition, for the good of western Nevada County and the world. I sign off with confidence and hope in the living Christ! The Rev. Bill Wong may be contacted by calling the church office, (530) 273-9631, or send an email to the church office. Please type “Attn Pastor Wong” in the subject line.